Linens, Art and Things Embroidered Table Runner Dresser Scarf Coffee Table Scarf Gold & Rust Roses on Antique Green 16" x 54"
Linens, Art and Things Embroidered Table Runner Dresser Scarf Coffee Table Scarf Gold & Rust Roses on Antique Green 16'' x 54'' by Linens, Art and Things at Frederick Douglas SMHA. MPN: H9645-17. Hurry! Limited time offer. Offer valid only while supplies last. 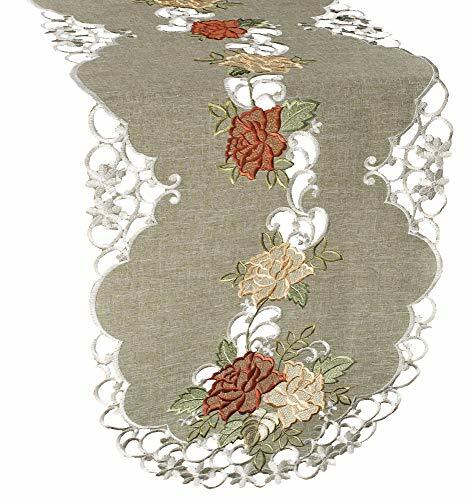 Table runner for your dining room table or a dresser scarf to protect your dresser in the bedroom, this runner will bring elegance to your home. If you have any questions about this product by Linens, Art and Things, contact us by completing and submitting the form below. If you are looking for a specif part number, please include it with your message. Linens, Art and Things Embroidered Green Leaf on Antique Green Fabric Table Runner Dresser Scarf Coffee Table Doily 16" x 70"